A variety of accommodation possibilities is available. At the cheaper end, we have arranged with a university residence on the Groenkloof campus to make rooms available. These rooms normally provide student accommodation and are quite basic with shared bathrooms. 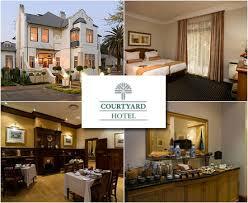 The rate for this accommodation is R360 pp per night. Breakfast is available at R78 and dinner at R116. In order to book this accommodation you need to complete the attached form and submit to the conference secretary <[email protected]> by 3 June 2019. Most of the hotels are not very close to the campus. Hotels may provide transport between the campus and hotels. In the attached spreadsheet, all information about hotels are provided. Here is the accomodation matrix. Hotels and guest houses flagged in green, will provide daily transport to the campus. For those in yellow, we are still trying to arrange transport and those flagged in red do not provide transport. In these cases you will need to take a taxi or UBER. Provisional prices are provided and booking codes for some hotels. The use of booking codes is necessary for special rates and to ascertain how many delegates are staying at each hotel/guest house.